A Primer on Using Spreadsheets. Chemical Kinetics in Food Processing. Microbial Destruction in Thermal Processing of Foods. Statistical Quality Control in Food Processing. Sensory Evaluation of Foods. Mechanical Transport of Liquid Foods. Steady State Heat Transfer in Food Processing. Transient Heat Transfer in Food Processing. Refrigeration, Freezing, and Cold Chain. Evaporation, Steam Properties, and Psychrometrics. References. Appendix. Subject Index. The Institute of Food Technologists (IFT) recently endorsed the use of computers in food science education. The minimum standards for degrees in food science, as suggested by IFT,"require the students to use computers in the solution of problems, the collection and analysis of data, the control processes, in addition to word processing. "Because they are widely used in business, allow statistical and graphical of experimental data, and can mimic laboratory experimentation, spreadsheets provide an ideal tool for learning the important features of computers and programming. In addition, they are ideally suited for food science students, who usually do not have an extensive mathematical background. 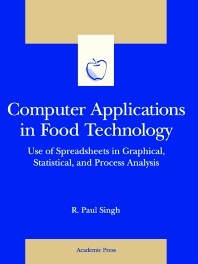 Drawing from the many courses he has taught at UC Davis, Dr. Singh covers the general basics of spreadsheets using examples specific to food science. He includes more than 50 solved problems drawn from key areas of food science, namely food microbiology, food chemistry, sensory evaluation, statistical quality control, and food engineering. Each problem is presented with the required equations and detailed steps necessary for programming the spreadsheet. Helpful hints in using the spreadsheets are also provided throughout the text. Ideal for students in food science and technology programs as well as researchers in academia and industry.